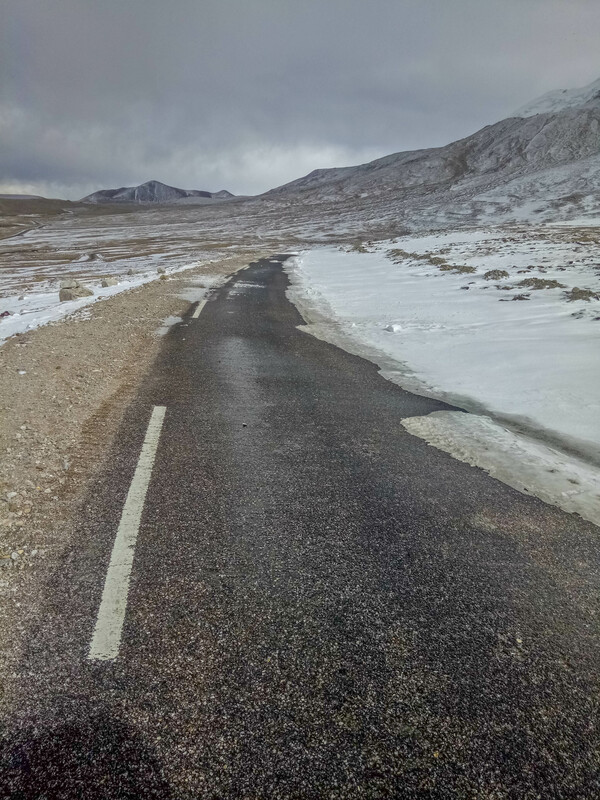 The last few kilometers to the Gurudongmar and Tso Lhamo lakes in North Sikkim is smooth tarmac. The earlier sections are dirt tracks. You would expect it to be the opposite. But I guess the reason for the tarmac road being later and not earlier is because it involves a steep climb. The army vehicles are able to climb up the dirt track using snow chains. But I guess they would need tarmac to deal with the steep incline that comes after. The soldier driving the Army gypsy escorting us to the lakes drove like we were be chased by Chinese tanks. He knew his vehicle well and drive like a professional rally driver. As you can see in this picture, there were some sections where half the road was covered with snow and ice under it. He went flying over these sections by using a technique that I hope to try one day. What he did was turn the jeep right into the ice so that the nose was almost pointing to the the mountains on our right.. Then as expected the right wheels skidded over the ice, while the left wheels held their ground due to contact with tarmac. Due to this the jeep started to twist left and appeared to go out of control. He then turned the steering wheel left to accommodate the twist. By the time we were out of the ice, the jeep was facing straight on the tarmac getting ready to do this all over again. All this was done in a smooth flowing motion that it felt natural. Denzil Nunes and I were enjoying this madness sitting at the back of the jeep clinging on to the dear life. This adventure just kept getting better and better.